A deceptively sunny day at the beginning of my winter Camino de Santiago. I’ve been in Spain for over two weeks, and have been doing a winter hike of the Camino de Santiago for ten days so far. I wanted to walk in the winter to avoid the massive crowds that come to the Camino in the summer (because I’m an introvert). I flew into Madrid without really researching ahead of time how I would get to St.-Jean-Pied-de-Port, France. I figured if thousands of other people did it every year, I could too. I took a bus from Madrid to Pamplona, which took maybe six hours. From there, I had hoped that I would find a direct bus to St. Jean. Alas, there were no direct buses until spring. Still wanting to start in St. Jean, I took a bus as far as I could go to the town of Roncesvalles. I was attached to starting in St. Jean because so many others begin their pilgrimage there and I’ve never been to France and wanted to cross the border. First day of rough weather on the Camino. After a night in Roncesvalles, I began walking backwards on the Camino towards St. Jean. It was 15 miles, and I made it in a day. However, the downhill to get there was so steep that my legs were sore for a couple days after. The weather was deceptively pleasant. The sun was shining and the temperature was warm. I wondered if northern Spain was always this nice in the winter. Finally, I was in France and made my way to the pilgrim’s office. The nice couple who volunteered there questioningly looked at my credential (side note: pilgrims carry “credentials” that are a sort of hiking permit that gets stamped along the journey) and wondered why I was going backwards. In my embarrassingly limited Spanish I did my best to explain my reasoning. They told me to come back the next day at noon and they would give me a ride part way back to Roncesvalles, so I wouldn’t have to walk as much of the same thing twice. I happily agreed. Leaving the village in the morning. Before beginning this winter Camino de Santiago walk, I wondered whether there would be any other crazy people out doing the same thing. Or would I be the only one? I went to the local albergue in St. Jean, which is a hostel of sorts just for pilgrims. Albergues are usually a big room with lots of bunk beds. They cost anywhere from a donation to 12 euros. It turns out I was not the only one with the idea for a winter Camino. There were four other pilgrims in the albergue that night. I didn’t talk to them much the first day, but we’re still walking together now. It seems the further I walk, the more people I meet who are beginning their own journeys. The Camino doesn’t have a precise start point like US trails often do. You can kind of just start wherever with the goal of reaching Santiago. Nowadays, I often see nearly a dozen people in the albergues in the evening. Walking on a rainy, cold day. Like I said, my first few days were deceptively nice weather-wise. Then began the real winter weather, which to be fair is still nicer than Ohio weather in January. But having lived in Utah for a couple years, I’m a baby when it comes to the cold nowadays. So the weather is not terrible, but it still has been raining a bit almost everyday and is often chilly and windy. I’m talking maybe 40’s F cold. It hasn’t been below freezing during the day… yet. I keep hearing the occasional gossip of where on the route it’s been snowing. I am still trudging on everyday, making the kilometers slowly disappear. It’s been too annoying to constantly convert to miles from kilometers, so I’ve just given up and am giving into the metric system. Please don’t take away my American passport because of this. After a few days of walking in boots, I got tired of how badly my feet would hurt at the end of the day. In Pamplona, I went to the department store to get a pair of trail runners. Thankfully, they had my favorite brand Salomon. Unfortunately, the price was 150 euros. I probably could have saved about 40 bucks if I had bought a pair at home. The Italians and I hiking on a chilly day. I’ve been walking with a group of four Italians and one Spaniard pretty much this entire time. We had a Korean friend in the group for awhile, but he’s fast and left us in the dust. It’s been cool experiencing the way Europeans do things differently from me. For example, if we reach our destination for the day and want to have a meal sometimes we sit there eating and drinking wine for up to two hours. I don’t know if I’ve ever had a two hour long meal in a restaurant in the US. Also, they eat SO MUCH BREAD. Literally at least three times a day. This group goes through multiple baguettes a day. Wondering how much further until lunch. Aside from all the delicious bread and wine, there’s the coffee. Coffee in Spain is way better than at home. They add steamed milk to it, and it’s so strong. And a coffee is usually about one euro, so the price is right too. I was hoping to improve my Spanish while here, but I’m spending more time learning Italian phrases. Out of everyone in my hiking group, two of the guys speak English. That’s been another aspect of the trip is not understanding what people are saying or what’s going on most of the time. I think it’s good for me though. What more could I ask for than a fountain of wine? One of the highlights of the past week for me was seeing the famous wine fountain in the village of Estella. Literally you turn the fountain on and wine comes out. It’s like magic. Of course I was there at about 10 am, so I just had a few drinks and moved on with my day. Another funny encounter was walking into a village one day, we smelled the most delicious scent of fresh bread coming from a bakery van. The Italians flagged down the driver. He stopped and opened the back door to reveal baskets upon baskets of baguettes. At two euros for a baguette, we bought a few a made lunch of out it. Overall, I’m about one-fourth of the way done with my walk. I’m feeling good about it and am still excited to put on my trail runners every morning and see more of the Spanish countryside. *There’s affiliate links in this post, meaning if you buy something I may get a small commission at no charge to you. I have been reading every story I can get my hands on about recent experiences on the Camino de Santiago. Im very excited to follow your story as it is a whole different time of travel. I hope to be walking it, myself, next year as my health improves. Thank you so much for sharing. Thanks so much for reading along. I wish you well with your health, and I hope you’re on the Camino next year! Like the way you are chronicling. Thanks for sharing that and the images. Looking forward to reading more. I’m glad you’re enjoying it so far! Ha, the Camino Frances. I had such a magical time back in July -Sept 2017 walking both this and Camino Portuguese (incl a week end of December, Porto – Ponferrada) The mountains as you near Galicia, are truly spectacular. Remember, this is a marathon, not a sprint. Take your time to enjoy the small towns and villages en route, the amazing people you meet, and the hospitality of the locals. My Camino was a chance encounter, as I had never even heard of it, until listening to a guitar player from Chile, whilst sipping coffee in a hippy market in Byron Bay, NSW, Australia – June 2017. Now, i’m a real perregrino and returning in April to do Camino Primitivo. Buen Camino! Disfruta! That’s such a good story of how you heard about the Camino; magical almost. I’m loving the experience so far. Thanks for sharing your wisdom! I really enjoy following you. Hopefully one day I’ll be fellow traveler. Cheers. I did the Camino Frances in Nov-Dec 2014, starting at SJPdP. It was great, and some days I didn’t see another living soul. Many albergues were closed for the season, so I stayed in modest hotels. Recently I read that first stage to Roncesvalles is closed Nov-March due to safety issues. That may be why they looked at you funny at the pilgrim office. There is a low route from St. Jean that pilgrims can take instead. That’s interesting that most of the albergues were closed for you. I’ve only stayed in them so far! I wonder if a winter Camino has become more popular in the last few years? Hi Megan… ..I enjoyed the pictures….have fun and be safe. If you’re doing training hikes in NC, you should be all set for the Camino. It’s pretty flat. Good luck with all your preparation. Very cool! 0 degrees where I am. 40 sounds awsome. Would love your adventures but I’d travel along I think as I’m more introverted. For sure, I’m a bit of an introvert too! I’m glad I’m not in 0 weather. Brrr. Love your story! You are right about Europeans and their long dinners. I had a three hour long dinner at a gite in France in October, and many longer than 2 hours. The long dinners with complete strangers was one of the most fun parts of my trip in France. I’m a bit of a wimp these days, (I think) my days of walking in snow and winter weather are over. Bon Chemin! Well done Megan! I walked Carcassonne to Lourdes and St. Jean-Pied-de-Port to Santiago to Fátima, last May-July and another 11 days in Ireland. Amazing time! By now you’ve maybe reached Villafranca Montes de Oca or even Burgos! I’m so jealous. Don’t worry about the bread – enjoy while you can! As for me, there was so much sensory input I am still processing it all. I wish you the best on your Way! Hi Megan, I’m jealous that you walking the Camino now but the way you write takes me there along with your wonderful photos. Please keep writing and sharing. Megan, Buen Camino. Did it in August 2017, and understand your desire to follow the way of St James without the here. LOL. Best of luck on your travels. I walked the path in Sept/Oct 2014. The weather was gorgeous for the most part. But yes, there were many pilgrims. I suspect you are finding many hours of solitude on the trail this time of year. 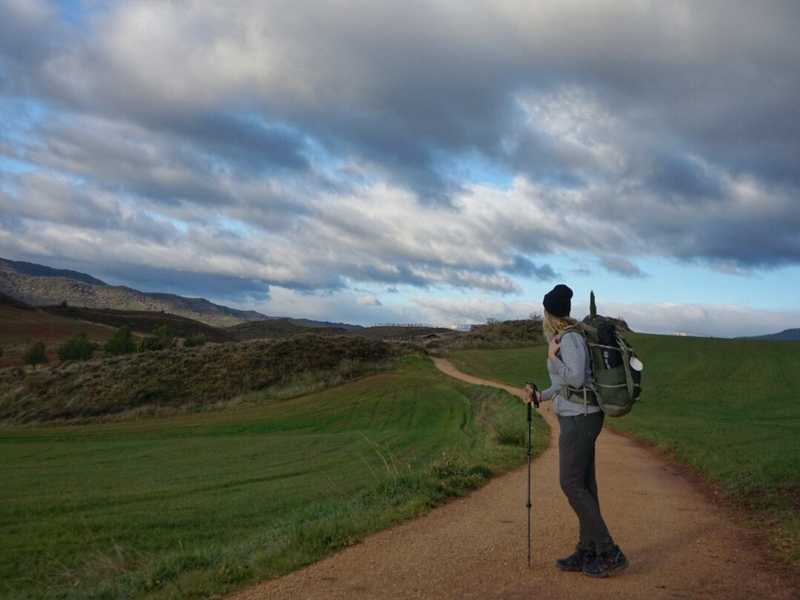 Some of my best memories on the Camino were rare moments I felt like I was all alone. You are probably experiencing that feeling much more often. Curious, will you attempt to write and express those introspective thoughts and emotions that come at those special times? That’s wild to hear that even in October there were lots of pilgrims. I can’t imagine. I do find a good bit of solitude, but there’s also always company when I want it. I haven’t decided yet about expressing my introspective thoughts… I’ll think about it. I LOVE your chronicle! Thank you very much for sharing! Hey there! What size pack did you bring? I am doing the camino in April! I have a 65 liter pack, but that’s just because I’m traveling more after the Camino. I don’t need that much space. Thanks so much! I look forward to reading more of your blog posts. I first found your blog in search for trip reports of the Huayhuash circuit and plans changed but I still hope to get there some day!